Friends, things have been c-razy around here- a self induced chaos, entirely my own fault, but crazy just the same. 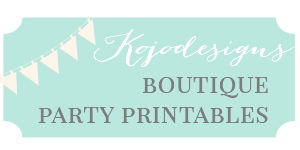 Between launching Shiny Happy Sprinkles, getting ready for a couple of upcoming trips (including a little trip to Thanksgiving Point for SNAP– will I see any of you there? ), and a full que of projects and deadlines, I feel like I’m about at capacity. Which makes today the perfect day to share a simple project that’s been finished-but-not-photographed for weeks- my latest and greatest home decor project. 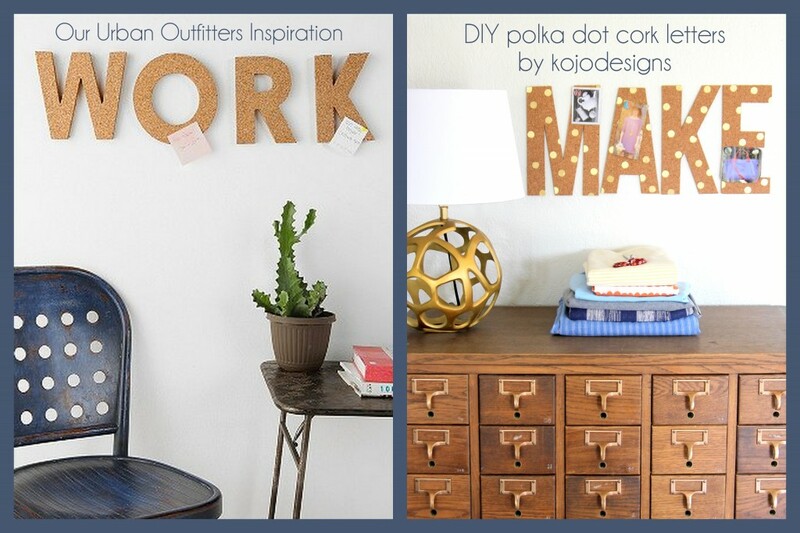 I saw those cork letters at Urban Outfitters awhile back and thought the word “M-A-K-E” would be perfect above my sewing machine. 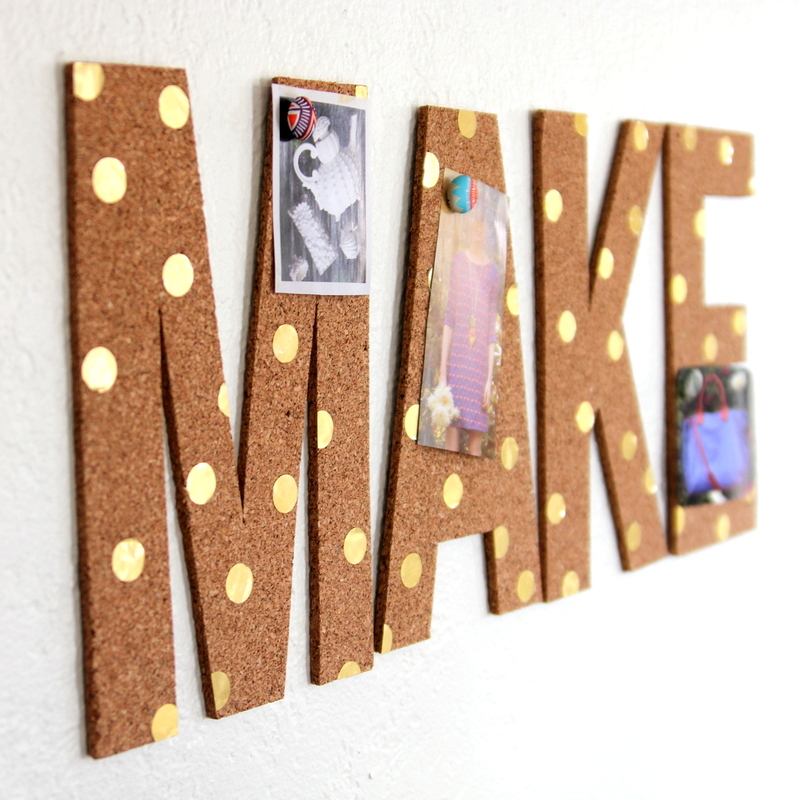 Since I had some cork tiles on hand, I DIYed my own cork letters for my studio/craft room/office. I even added some metallic polka dots for a little punch. To put these together, I printed out “M, A, K, E” templates on cardstock. 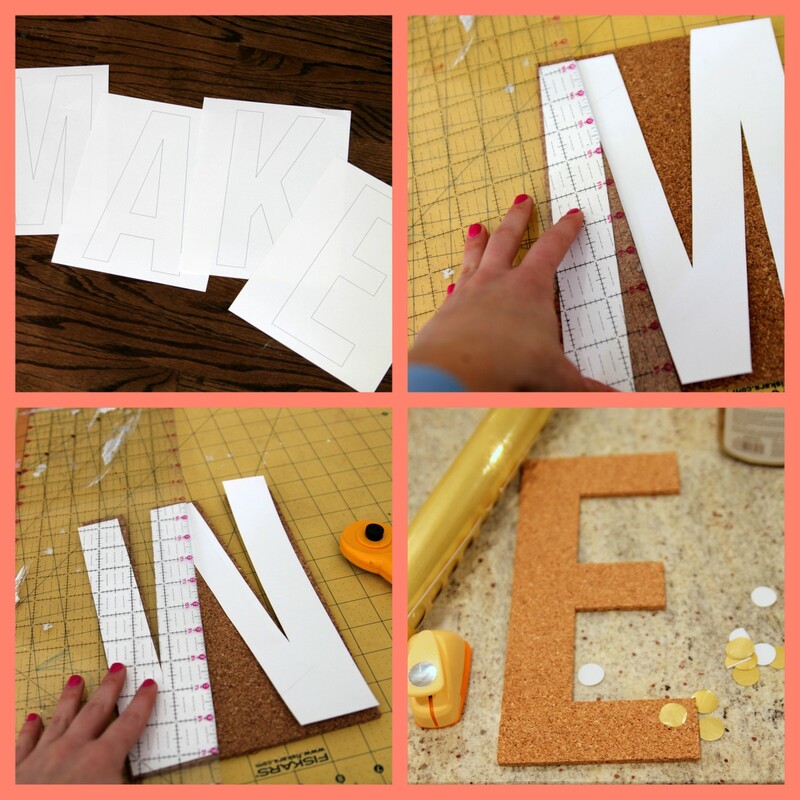 Then I cut out each paper letter and used the paper letters as templates to cut out my cork letters. I found it was easiest to cut the cork with a straight edge and rotary cutter (I had to go over each cut a few times to make clean lines on the cork). 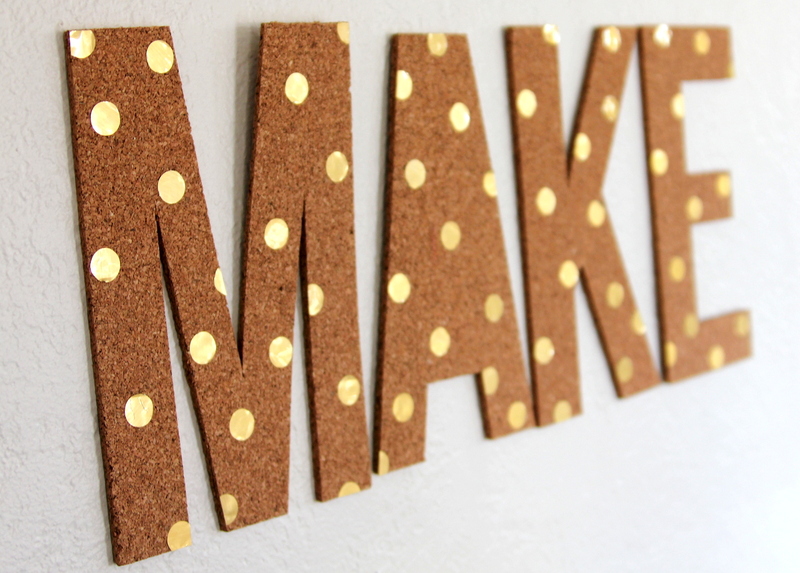 To finish the project off, I punched out metallic vinyl polka dots and stuck them on my cork letters. Add a couple of fun fabric pushpins and some Anthro-y inspiration and voila! A wall-decor-meets-inspiration-board project, perfectly at home above my pile of current sewing projects (though, full disclosure- that fabulous card catalog is only in my space temporarily until Adam makes it part of a living room built in… I am making sure it is well loved until then, though). Also, that really is my current in-progress project pile (look at all of those muted stripes and solids). Any guesses as to their ‘final destinations’? This is so cool! 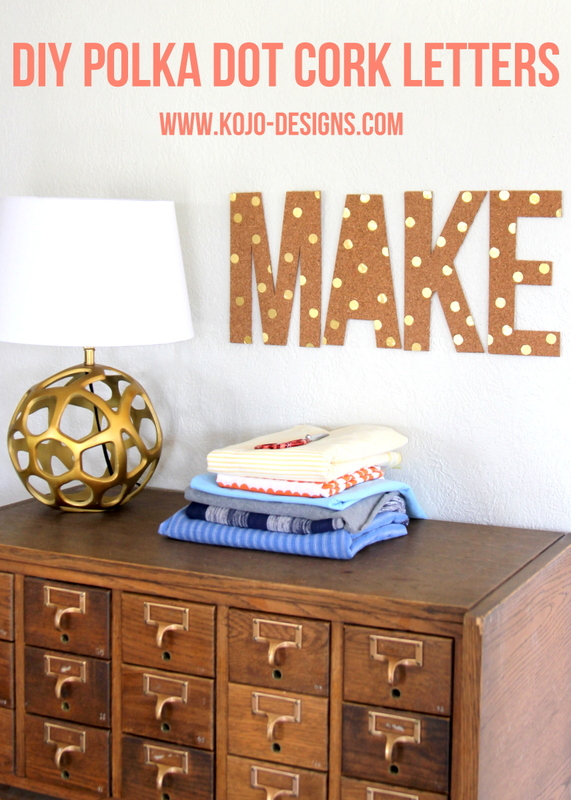 The ‘MAKE’ is perfect for a craft room (I’m a little biased 🙂 And wow, your table and lamp are so gorgeous, where did you get them? Ooh I love this Kirstin! 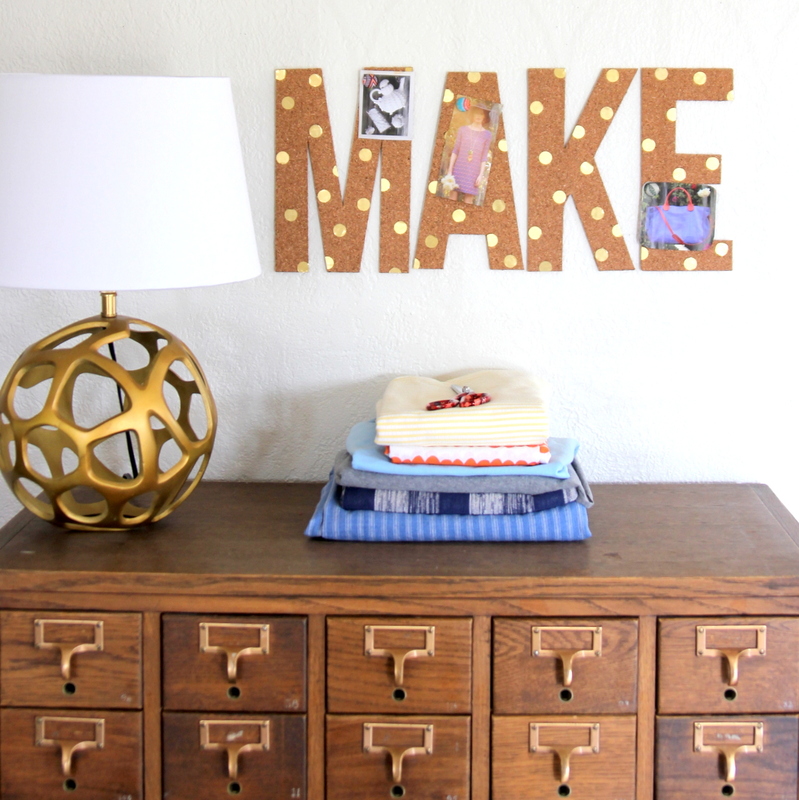 The metallic dots are the perfect touch. May I ask where you like to buy your cork? I love it! I am a major fan of polka dots and I think your beautiful dots added the perfect touch! love love love. love your version way better! thanks for the tutorial! these are absolutely fabulous!! So in love!